NHS hospital workers have been warned about a homeless man who has faked serious illness - including Ebola and AIDS - to receive treatment, food and a bed. Christopher Dearlove has cost the NHS thousands of pounds after using more than 70 aliases in years. 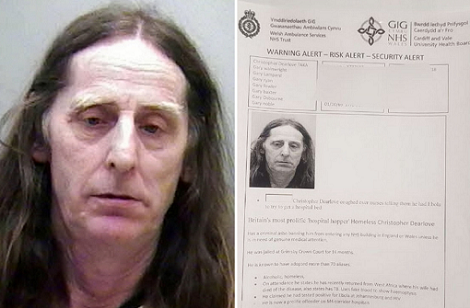 The 63-year-old has been described as the "UK's most prolific hospital hopper" and was given a criminal ASBO banning him from every NHS hospital building in England and Wales. But authorities are still concerned he is trying to trick the NHS with more lies and have issued a new "risk alert". A court had previously heard Dearlove coughed on nurses after claiming he had just returned from West Africa where his wife had died from the deadly Ebola virus. Medics donned protective clothing and masks and A&E came to a standstill in 2017. The court was also told the man tricked staff into thinking he was a haemophiliac with AIDS and coughed up fake blood to get a room to himself. Dearlove was eventually jailed for 14 months but has since completed his term. He also goes by the names Gary Wainwright, Gary Lampard, Gary Ryan and Gary Fowler. It's understood Dearlove is a "prolific offender" at hospitals along the M4 corridor in south Wales and south-west England.